More than 220 college students from 38 states attended the Associated Collegiate Press / College Media Association summer workshop at the University of Minnesota. Here are images of them at work — and play. As part of the photojournalism class, students went to Dinkytown just off the University of Minnesota campus to tell stories of the businesses and visitors there. The theme of the workshop was togetherness. For the first time, the Associated Collegiate Press and College Media Association came together to host a summer workshop with courses for advisers, coures in photojournalism and leadership. More than 200 students came to write stories, take pictures and engage in social media (#acpcmapress). Stressing the importance of taking pictures, editing them — as part of a team — and then being critiqued, the photojournalism class got two opportunities to challenge their visual storytelling skills. 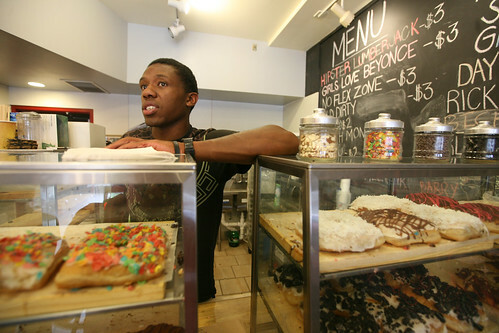 First, the dozen or so budding college photojournalists (some using digital phones, some using high-end DSLRs), went to Dinkytown to cover the new donut shop, the bookstore and the bike shop. I have done this assignment with student groups for more than a decade and even with high school reporters, teaming up with Scott Winter. 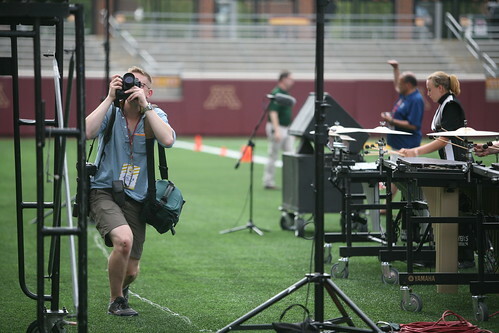 Second, the students got to go cover the Drum Corps International show in town. Most of the students hadn’t even heard of drum corps. So, after it was over, one enthusiastic photographer said, “That was cool.” She stressed that she had no idea how much work went in to these shows, observing that the players have to lift heavy instruments and even step right on the lines. The photographers too got to experience some of the stress the players had to endure. After all the 150 members of the Genesis Drum and Bugle Corps began performing June 26 with a show in Indiana. They perform in Belton July 21 and in San Antonio July 23. After 22 regular season performances, they will end their season Aug. 8-9 in Michigan City, Indiana as they compete for the Open Corps championship. Below are a series of stories written in a reporting class taught by Steven Chappell and Bob Bergland. And the photos taken by students in my photojournalism class. Enjoy. 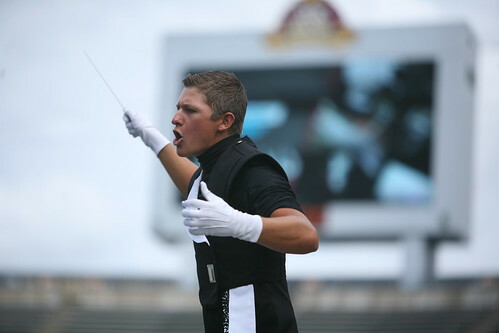 The rhythmic clicking of a drum major’s baton travels across the rustling wind at one of Drum Corps International’s biggest stops of their summer tour – its annual U.S. Marine Drum and Bugle Corps show in Minneapolis, Minnesota. John Filippone, a senior at the University of Texas at Austin and the head drum major for the Genesis Drum and Bugle Corps, leads the brass instruments as they prepare for competition July 16. Genesis is a competitive drum corps that was founded in 2009 and is based out of Austin, Texas. 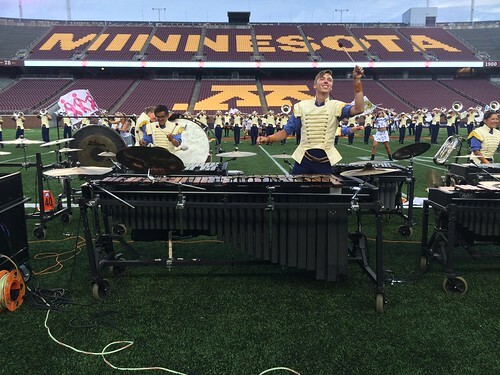 Later that afternoon, 150 members of Genesis were the first group to perform their synchronized routine in TCF Stadium as part of a Drum Corps International competition that featured more than 2,000 performers from throughout the United States. 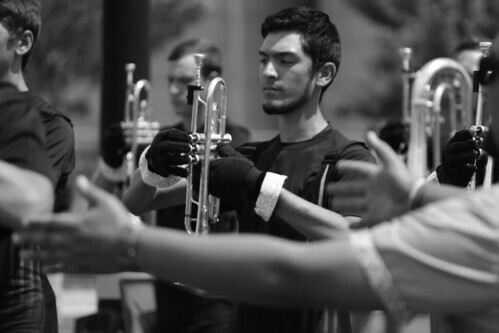 John Filipone, head drum major of Genesis, a corps from Austin, Texas, sets his baton aside to describe the experience of a summer life in the drum corps. Filipone was a part of the drum line for three years, starting at the age of 16, before being promoted to conductor. Filipone, a computer science major at the University of Texas, said he has no future corps or musical plans once he graduates, but it is the experience of being in charge of 150 people, and traveling and performing across the United States, that gives him life skills he could not get elsewhere. “All of this stuff is so applicable to real life, working with people, managing teams, how to set up a group for success, and how to help other people out, all that stuff is a huge learning experience,” he said. Gavin Burnham, who manages the Minnesota Brass, said the entire process for members is about developing strong leaders. “Being in the drum corps teaches discipline, and provides life long experiences they’ll remember forever,” Burnham said. After Minneapolis, just four weeks remain until the DCI World Championship Finals Aug. 13 in Indianapolis. Until then, the corps will continue crisscrossing the country, polishing their performances as they prepare for the final competition. 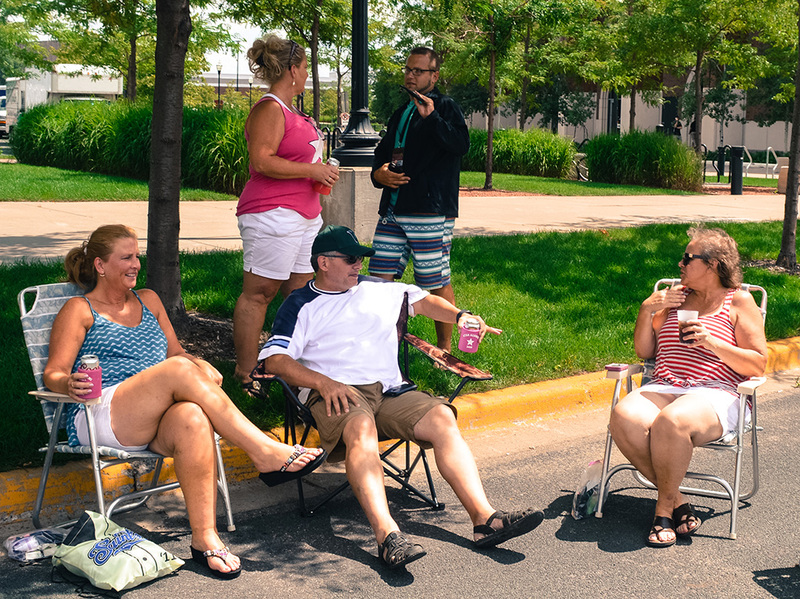 A group of people sits under small shade trees in the parking lot of TCF Bank Stadium on the University of Minnesota campus. The shade shifts away from where it was cast in the early morning, and is grows scarce throughout the lot. As the afternoon sun beats down on half of the group, their smiles haven’t faded as they continue to laugh, share drinks shoved in can koozies and reminisce of their days in the drum and bugle corps. The group is supporting their long-time friends, some of whom have become supervisors and coordinators for the River City Rhythm. The corps is a group in its second year and originates out of Anoka, Minn. The River City Rhythm is the first drum corps to make the Drum Corps Finals in its first year of competition, where they finished ninth. Having all spent time in the drum and bugle corps in one aspect or another, most of the group has been together in some respect for more than 30 years. During that time, they have seen many changes in the corps, including the evolution of Drum and Bugle Corps to Drum Corps International. The change to big-money drum corps has included the continued growth of bigger corps like the Madison Scouts and Santa Clara Vanguard. Larger corps have the budget to run a fleet of semi-trucks, which will carry instruments, equipment, uniforms and can even be equipped with a full kitchen. Large corps can afford such luxuries with massive budgets of hundreds of thousands of dollars. The River City Rhythm is growing at an extraordinarily fast rate after sprouting from the original 55 members in its first year to 90 in 2016. But color guard supervisor Tamara Schmidt says the corps still has goals for continued growth. Part of the growth of the River City Rhythm has included the purchase of a new semi-truck of its own, which was acquired with the help of funds from donors and board members. The ability to transport equipment with a semi-truck allows corps members security with their equipment and instruments, as theft is not an unusual occurrence at competitions. Schmidt says a member of a fellow corps had his car broken into and his horn was stolen out of his trunk. Tom Spielman, who has been around drum corps since his days on the baritone from 1964 to 1972, says one thing has stayed constant in that the top corps get to march under the lights. Spielman, wearing a white collared T-shirt with “Tom Foolery” printed across his left breast, recalls making nationals in 1972 and getting to do just that, something he had always wanted to do. The senior member of the group, Spielman says he taught most of the group as they were coming up through the ranks. Each competition is organized based on previous performance scores with the lowest scoring corps performing first and the highest scoring corps performing near the end of the competition, when night has fallen, the temperatures are a bit cooler, and the stadium lights are ablaze on the field. Even after all the years that have passed and the changes with drum corps, the group has stayed in contact and shares its common bond of time in the corps. With another four hours to wait before the competition begins, Schmidt and Farley’s friends stick with them in the lot of TCF Bank Stadium as they wait for the River City Rhythm to arrive for their final warmup before competition. Whether in a large, full-time drum corps that travels on fully-outfitted tour busses with TVs and a semi-truck-sized kitchen, or a small corps that is fighting with finances to stay alive each season, Schmidt and her long-time group of friends are proof that friendships and bonds can be created for a lifetime. “We don’t see each other [except] once a year …” said Patty Stehr. “Yeah, it’s a fraternity for life,” said Ron Stary. A genesis is something coming into existence or its origin. It’s symbolic that the mascot of the Genesis Drum and Bugle Corps is a phoenix, something that is born anew from the ashes, tenor-line member Brandon Stone said. Since Genesis first started in 2009 Edinburg, Texas, it has moved to Austin and continued to grow from where it was seven years ago. Those 150 members were the first to compete in the Drum Corps International Tour Saturday at TCF Bank Stadium in Minneapolis, Minnesota. They spent the afternoon in the sun before Saturday’s competition, sweat pouring down their faces as they rehearsed their music and marches. Drum Major John Filippone, who has been with the core for six years, said he helps the group stick to its strict daily schedule. He begins the day 15 minutes after everyone wakes up by leading everyone with 30 minutes of physical training followed by breakfast. Then the members go to rehearsals that run all day long. As for breaks, Filippone said they usually get one day every two weeks or so. Being around each other almost every hour of every day has increased the strong chemistry in the corps that has helped it grow. Marimba player Cameron Marquez said the group has created a family culture where everyone is comfortable with each other. Part of that culture is a toy Tyrannosaurus Rex appropriately named Wrex, which the corps uses to hype each other up. Culture is what could set this corps apart from the biggest lineup of corps to date set to perform Saturday. Marquez said this could be an opportunity for the corps to prepare for shows later in the year. Art Cano stands alone, looking on at the Genesis Drum and Bugle Corps during its final run-through just hours before the musicians will take the field for their latest performance in the 2016 Drum Corps International competition. 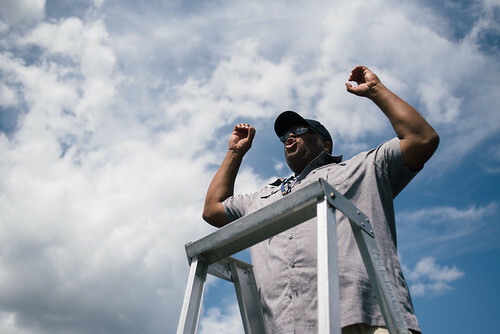 The San Juan, Texas, native watches in satisfaction, admiring how far his group has come since its conception in 2010, making it one of the youngest corps on tour. In just a matter of hours, the sounds of Genesis will fill up TCF Bank Stadium in downtime Minneapolis while it plays for an audience made up of some of the most renown drum lines in the world. A Genesis Drum Corps member performs in the DCI show in Minneapolis. Twenty groups performed in the show. Photo by Zach Bielinski. Cano, a middle-school band school teacher in Texas, is committed to the growth of his students not just at school but his Genesis students as well. Cano’s musical career began at an early age, participating in band from kindergarten to sixth grade. A trombonist, he played in the school band at Texas A&M-Kingsville. Cano and the 18 other Genesis staff members are committed to setting the bar higher for themselves and competing at a top-tier level. “Our goal is to match or exceed world class bands,” Cano said. He lines up in his position, waits for the signal, lifts his horn to his mouth and plays his routine. Albert Escobedo, a trumpet player for the Genesis Drum and Bugle Corps, repeats this procedure dozens of times a day, all in preparation for the next 10 to 11 and a half minutes he will spend on the field in actual competition. A drum corps is a marching band that consists only of percussion and brass instruments. This isn’t your high school, or even your collegiate, marching band experience. Escobedo and Genesis are part of Drum Corps International. 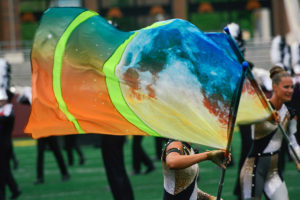 The organization sanctions competitions throughout the summer, in which dozens of corps and hundreds of musicians perform in front of judges for a chance to be named the Drum Corps World Champions. 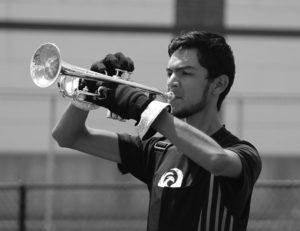 Escobedo, a 17-year-old high school senior from Los Fresnos, Texas, has been a part of the Genesis Drum and Bugle Corps for three years, and said enjoys being a part of it. A friend who had previously participated in the drum corps in the summer of 2013 introduced him to drum corps at a football game at his high school. Escobedo showed interest in the subject and was asked by his friend to go to the corps’ November training sessions. Escobedo went with him and never looked back. What separates a drum corps from the typical high school marching band is the amount of preparation that goes into each performance, and the difficulty of each performance. Before the band members even entered the field, they were out in the parking lot behind the stadium stretching their entire bodies, and doing various marching drills for close to an hour. The stretching was so important that getting an interview with Escobedo was difficult as one of the coaches wanted him to finish stretching properly. To the average person a drum corps is seen more as a side activity that people do for fun, and isn’t usually thought about when bringing up sports. Escobedo disagrees with that notion, arguing that drum corps is just as much of a sport as football or basketball. It may not have the same training regimen as a typical sport, but there is still tons of training for it. Escobedo said he sees the main goal as something more than just winning a competition. His approach is more geared toward putting on a good show for the fans. Escobedo, who is still in high school said he didn’t know if he will continue drum corps when he goes off to college, but he said he enjoys it so much that it would be surprising for him to not continue doing it while attending school. “For people that look at the activity and are kind of intimidated by the level of performance, and really doubting themselves and whether they can do it, I would say for people that want to be a prospective member that just to go for it, and not be afraid of achieving greatness,” Escobedo said. Correction: An earlier version of this story had Albert Escobedo’s name spelled incorrectly. This is not the first time I’ve taken photos of drum corps. Indeed, the first time was in 1982 when Westlake High School hosted the first, or one of the first, drum corps events in Austin. Members of the Madison Scouts lived in the band hall, practiced on our football field and stayed at our houses. The band parents and students ran the event as a volunteer staff just as we had done with the Westlake Marching Festival so many years. Perhaps my favorite moment of the two DCI events I helped with was when members of the Madison Scouts from Texas, four of them, came out at the end of the show and played their corps’ theme song — “You’ll Never Walk Alone.” These students, thousands of them, come from all over the world to play in these corps. They give up their summer to perform and to learn music and life skills.